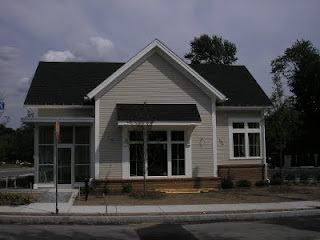 Construction on the new Cambridge Savings Bank branch is wrapping up. 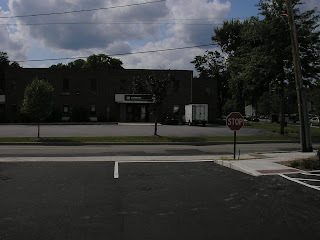 The new building at 181 Great Road replaces the Mobil Gas Station. Most of the exterior work has been completed. The bankm which is currently across the street in the Bedford Shopping Center should move in to the new building in the next few months. The new Bank has a dual drive through. 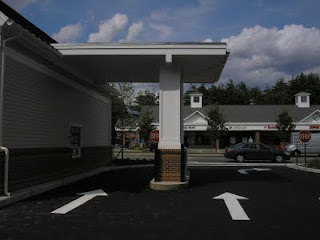 One lane for a Drive up ATM and the other lane for a human bank teller. Note that you can only make a right turn on to The Great Road. The parking lot also exits on to Weber Avenue. The sidewalk only extends to The Great Road. There is no sidewalk on Weber. Across the street is TD Banknorth. 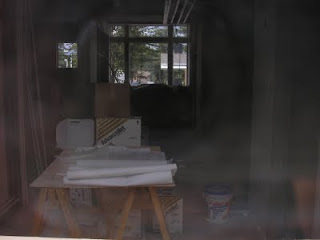 While the exterior has been completed, their is still much work to do with the interior. The view from Great Road. 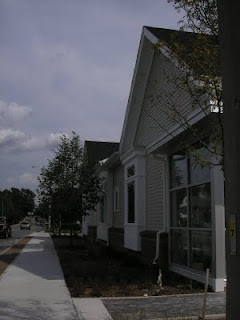 The sidewalk was rebuilt and set back further from the road while the building is set back closer to the road with parking in back to provide a more urban look.